After Tuesday night’s debacle, I had to take a few days off from politics. 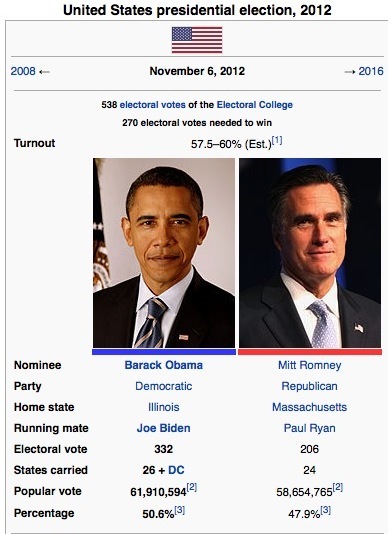 How in the hell did Romney lose? For my part, I gave him money and in my ward, I volunteered and drove 8 people to the polling station. Plus, Obama has been the most incompetent leader we have had in decades. 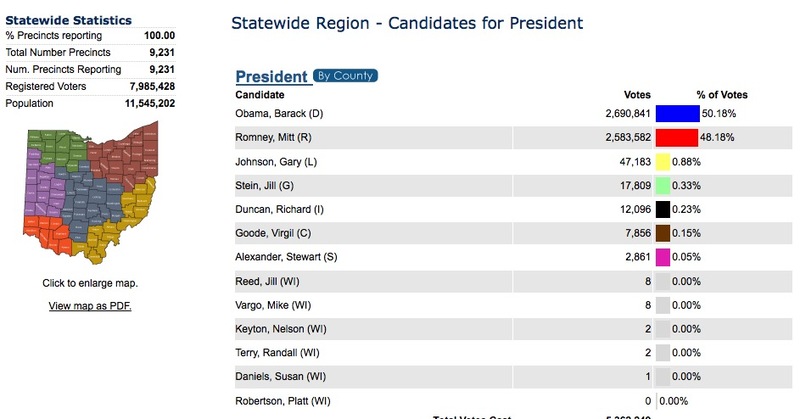 First, it seems Romney’s iPhone/Android app approach to getting out the vote was horrible. In fact, the software crashed and more than likely, some of the older volunteers just didn’t understand the “whole” computer thing in the first place. So you have that. Apparently black folks, despite the fact they face over 14% unemployment, almost exclusively voted for a Democratic and fellow African-American. Hispanics and women also voted predominately for Obama as well. The good thing, is that Obama didn’t win by a landslide. In fact, voter turnout was lower in 2012. 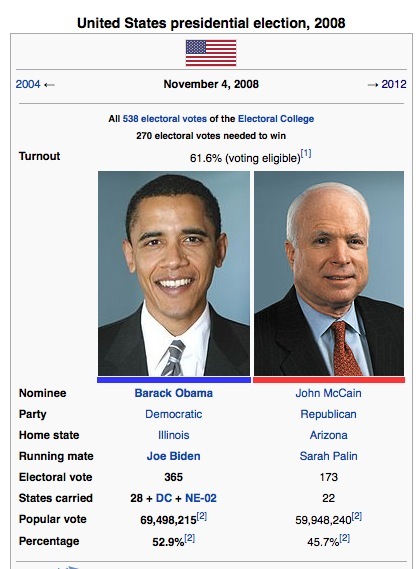 Both Romney and Obama received fewer votes than Obama and McCain received in 2008. This wasn’t a washout, so there isn’t a need to re-brand the Republican Party as a Democratic lite alternative. Hell, even Obama lost 8 million voters this time around. The question then is how do we appeal to those 8 million who didn’t vote for Obama this time? My belief is that we should oppose illegal immigration, because it is the right thing to do. We should still demand sane fiscal policies, because it is the right thing to do . And we should still stick to our core moral values, because it is the right thing to do. With that being said, we first need to reach out to both blacks and Hispanics at the ward level and preach the gospel of wealth to them. Offer free dinners that only require listening to our political pitch to eat. Explain to them how conservatism actually is better for them than the welfare state. How difficult would it be to write down the principles of conservatism and require ward captains to the head of the RNC know it by heart? Because as of right now, there are not 10 national Republican politicians that could explain the benefits of our value system. Second, copy the get out the vote mechanism that the Democrats use. If that means busing people to the polls, do it. If that means having a filled out absentee ballot ready for their signature in return for a gift care do it. But we must get the vote out. Why hasn’t the Republican Party done this already? It is simply malfeasance that the Republican Party has no such mechanism in place. Who the hell knows how to appeal to women, but at least, let’s make sure every Republican candidate knows how to answer questions about abortion. That’s a softball question, but we had to senatorial candidates blow it. In essence, it seems part of our base has sat out the last two elections. Part of the reason I believe that this is happening, is that we have had two candidates that really stood for nothing. For instance, Romney was a nice guy, and I still think he would have been a great president who would have risen to the occasion, but Romney never once appealed to the conservative base. He played it down the middle, he espoused platitudes which obviously didn’t impress the independents, the conservative base, or the 8 million voters who deserted Obama. Standing for nothing does not attract votes for our candidates. If we just did what I have suggested above, how hard would it have been bring the 100,000 votes that won Ohio for Obama over to our side? 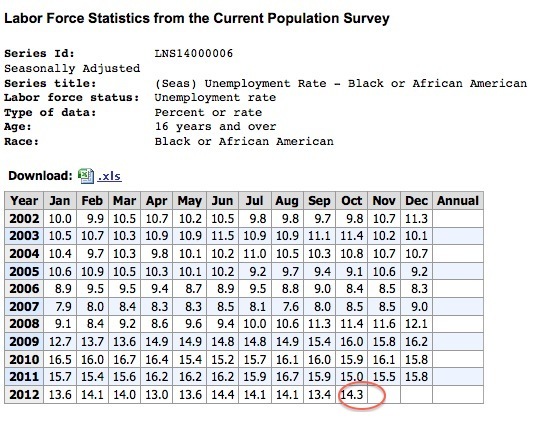 Finally, one has to ask, with the failure of Obama to fix the economy, how in the hell did he get re-elected? Unfortunately, there are people fine with living off the government. There will be a percentage of these people that even the most aggressive GOTV will never reach. There also is a large percentage of people who are not rational. Chalk it up to low IQ or poor education, facts mean nothing to these people. There is nothing we can do about these folks and unfortunately, they seem attracted to the Democratic party. On the bright side, if we copy the Democratic GOTV model and nominate a candidate who can espouse what it means to be a conservative, we can peel off the votes we need to win. If we take 20% of the black vote, 30% of the Hispanic vote, and claw back 10% of females, it will a short interlude of Democratic rule. For the time being, 51% of the people have made a poor choice and they will suffer the consequences. The economy will not recover under Obama. Many people will be consigned to permanent part-time jobs because of Obamacare and because of his ego and ideology, Obama will not compromise over budget issues. In essence, the 51% have crapped in their own bed and I say let them lay in it and we should refuse to change their sheets. In four years, they will grow weary of the the economy and because of fiscal constraints, welfare, will be, by the logic of math, be cut. With a proper GOTV program and a party that knows how to espouse traditional American values, we can once again win nationwide. While it will be a hard four years, now is the time to reform the Republican Party and prepare for the next election.